Jeff has done it again at his Etsy shop Jeffery James Modern. 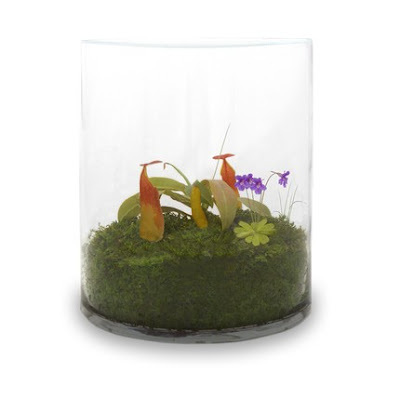 My favorite is the CARNIVOROUS HERBIVOROUS terrarium featuring a Pitcher Plant and a gorgeous little purple Butterwort. It's a great, balanced terrarium with the bonus interaction of feeding (if you so choose)! The pitchers’ of the Pitcher Plant contains a digestive liquid that will trap unsuspecting insects....Squeamish about feeding… Leave the lid ajar to provide the plants with food. If you’re a carnivore, give them a monthly treat of an insect found outside or around the house. Now thats My Style. Love those carnivorous plants !! Thanks for the terrific post Lauren!!! WOW!!!! This would give me a way to clean up the window sill from those pesky flys. The terrarium look beautiful. I love the color contrasts. This is really inspiring and also useful information. I've grown a Pinguicula very successfully all summer. It's been a flowering machine. However now that it has been brought indoors and under lights, it's very unhappy, not liking the dry air. So, a terrarium is the obvious answer. Thanks.